Wellesley College senior and basketball co-captain Malia Maier may have finished her collegiate hoops career, but her name will be remembered for years to come. The Torrence, Calif., native's leadership has improved her team's standings and put her into not only the Wellesley record books, but the NCAA record books, as well. 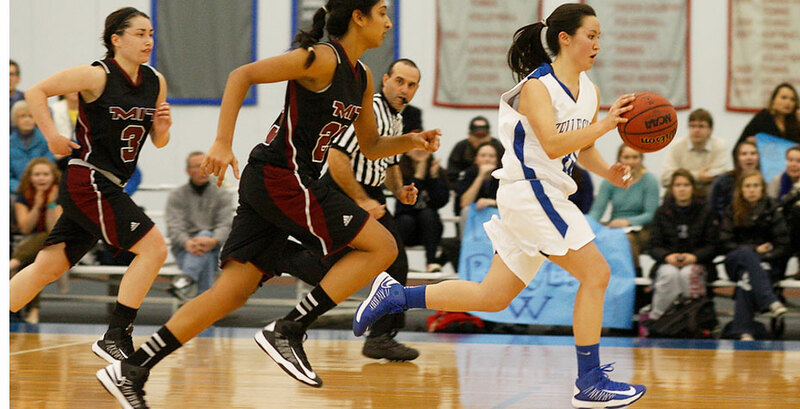 In four years, Maier compiled 1,001 points, 449 steals, and 416 assists for the Blue. She holds the all-time Wellesley record for both steals and assists and ranks ninth all-time in scoring. In each of her four seasons at Wellesley, Maier ranked in the top five in steals-per-game average, including finishing second in 2010 and third this year. Maier had a chance at the national steals title again this season, but while she was chasing that title, something happened that hadn’t in more than 10 years for the team. The Blue advanced to the NEWMAC Championship game and earned an ECAC Championship berth. The more games Maier played, the less likely it was for her to keep up her nearly five steals per game, especially against playoff-caliber teams. So while Maier finished third in the nation in steals per game, the extra playoff games allowed her to hit another career milestone: 1,000 career points. Maier reached the plateau in the semifinal game of the ECAC Championships, on a free throw early in the second half. Even without scoring her 1,000th point, Maier’s career would be an outstanding success. Once she hit that mark, however, she joined an exclusive club: 1,000+ points, 400+ steals, 400+ assists. Maier is one of only 11 players all-time in NCAA Division III to accomplish that feat. “I wasn't thinking about reaching 1,000 points,” said Maier, “because the bigger goal in my mind was winning a NEWMAC championship, something our program has dreamt of for a very long time. I honestly would have traded reaching the 1,000-point milestone that day for a win and a chance to play in the ECAC championship game. Maier ended her career ranked seventh all-time in NCAA Division III history with her 449 total steals. She also ranks 17th all-time with a career total of 4.49 steals per game. Her appearance in the NCAA record book is the first for a Wellesley since Liza Janssen (Petra) ’94. A three-time NEWMAC All-Conference selection, Maier also has the second most All-Conference honors in Wellesley basketball history (behind Petra’s four awards). In addition, she was named a Seven Sisters Senior Scholar Athlete and a finalist for the Barbara Barnes Hauptfuhrer Scholar-Athlete Award. Maier’s impressive individual accomplishments are matched by the impact she has had on the Blue throughout her career. As a first-year her team went 9-16 overall, but advanced to the NEWMAC Semifinals for the first time in eight seasons. Each year after that, Maier led her team to an increase in victories, and steadily improved their conference record. As a senior, Maier’s team finished with a 16-11 record, the most wins for the program since the 2001-02 season. Maier credits her team for the success she’s had. “Obviously none of my records would have been possible without my teammates. The only reason I was able to go for so many steals was because I was so confident in the fact that my teammates would cover me defensively,” she said. Although the season ended in the ECAC semifinals, the 2012-13 Blue accomplished more than any Wellesley basketball team in the past 10 years. Maier earned her place in both the Wellesley and the NCAA record books, ensuring that #10 will not be forgotten anytime soon.